In my previous post I discussed why I think that most commercially produced boards are not the best investments. In this post, which is related to a much earlier post, I want to discuss why fingerboard training may not be the most effective use of your training time. As I mentioned before, there seems to be a lot of interest in fingerboards right now. There isn't a training forum out there that isn't visited weekly with posts about whether fingerboards will help and how to use them and so on. Every post pretty much asks the same thing: will a fingerboard make me stronger? The truth is simple; it depends. Here is my view about some common beliefs about fingerboards. First myth: Fingerboards are essential for making a step up the grades. For the climber operating much below V5 or mid-5.12, fingerboards really have no place in your climbing training unless you are stuck for time and don't have access to a climbing wall. At that level, the use of a fingerboard is a waste of time better spent getting stronger actually climbing and understanding what climbing harder is actually about. It's about moving well, using your feet, and keeping your focus when the going gets tough. Fingerboards do not train those skills. If you ask around, the vast majority of top-end boulderers spend next to no time on a fingerboard. They climb instead. Second myth: Fingerboards should be a constant part of your training plan. I would recommend phases of fingerboarding, no more than two or three times a week for no longer than a few weeks in duration with a month or two break in between. The potential for getting stale and worse, injured, is too high considering the limited benefits. Use the board to kickstart your next power training phase and then set it aside for a while and train while climbing. Third myth: Fingerboards make you a stronger climber. The ability to climb hard, in my view, is not merely catching a hold and hanging on, but instead is reflected in how far you can lock off to the next hold with the last hand well below you. Independence of both arms when moving on steep terrain is what it's all about. Fingerboards will not necessarily help this kind of strength as hanging on with two hands is much easier than with one, and hanging with one is infinitely easier than pulling up on one hand on an edge. Fourth myth: you can train power on a fingerboard. Power is work produced in a given unit of time. If you can generate maximum force in half a second instead of two, you are using more power to do that and that is very helpful in doing hard moves. 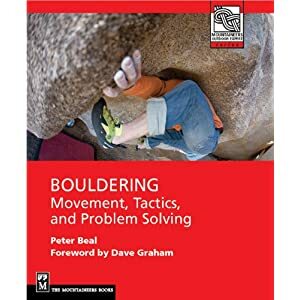 Power is everything in hard bouldering but it is very hard to generate power effectively on a fingerboard. Everything points to the campus board for that but as with the fingerboard, it's not that simple. Again, maybe in another post. Fifth myth: Hanging on smaller holds equals a stronger climber. See myth 3. Hanging with two hands off a super thin edge is of minimal use because most problems don't require that kind of hold. More typical is the scenario mentioned above, a long pull from one decent-sized hold to another, repeated 6 to 10 times. That said, many commercial hangboards feature holds that are simply too big to be much use for the serious climber. Sixth myth: Adding weight is a constructive way to increase resistance. See myth 3 again. Hanging on with two hands is too easy, even with weight on. It's much more constructive to work on your one-handed ability than to add 50 or 75 pounds and get meager gains. Seventh myth: While I'm hanging, I might as well do some pull-ups. Sure, if they are one-arms. Otherwise, you are just training endurance hanging on with two hands which happens in bouldering, well, basically never. Thanks for the post Peter. What do you think of this article? http://journals.lww.com/nsca-jscr/Abstract/2013/02000/Differences_in_Climbing_Specific_Strength_Between.5.aspx. I believe that takeaway to be greater grip strength = greater endurance. In which case, I can think of a few of my projects that this might prove helpful. Thoughts? agreed. i think there are some neuromuscular adaptations in the beginning (the body tension necessary to hang a 6mm edge seems useful), but for more advanced climbers it should be used primarily as a good progressive warmup. i do still visit ye olde hangboard for one arms and finger isolation, but i prefer the specificity of limit bouldering for strength gains. That was a long long time ago! I just read this post again after a few month, and one thing especially stood out to me: "Everything points to the campus board for that but as with the fingerboard, it's not that simple. Again, maybe in another post." I would be very glad if maybe you had the time to elaborate on the campus board, since I value your insights very much. Do you have any scientific data to prove any of your claims? Eva Lopez does and her findings contradict yours in large parts. Check out her blog! Thanks for the comment about Eva. I like her work a lot. Can you be more specific about contradictions? My conclusions are based on observation of myself and others. A comprehensive scientific survey of climbing training in any sense has yet to be done. David, I am working on a campus board post. Weird question, but how long, to your knowledge, have climbing fingerboards been in use? I've been using a fingerboard for few years now, as an addition to my training regime at the local wall. I just think that, like everything, you need common sense. It's a tool, it won't make you climb harder grades on its own, but on top of a well thought out training schedule, it can surely bring some major benefits. And if, like millions other climbers, you ain't got much time to hit the wall 2/3 times a week, it's an hard 'n fast way to get focused training in less than 1 hour, maybe just before going to work.